Fischer Connectors is a leader in connectors and cable assembly solutions. The Swiss based company has made its mark in the marine technology market because of the IP68 sealing of its rugged push-pull connectors. Fischer Connectors guarantees high performance even in the most difficult and harsh environments. Fischer Connectors has been designing, manufacturing and distributing high performance connectors and cable assembly solutions for almost 60 years. Known for its reliability, precision and resistance to demanding and harsh environments, Fischer Connectors’ products are commonly used in fields requiring faultless quality, such as all types of marine technology applications. Fischer Connectors’ primary design and manufacturing facilities are located in Saint-Prex, Switzerland. 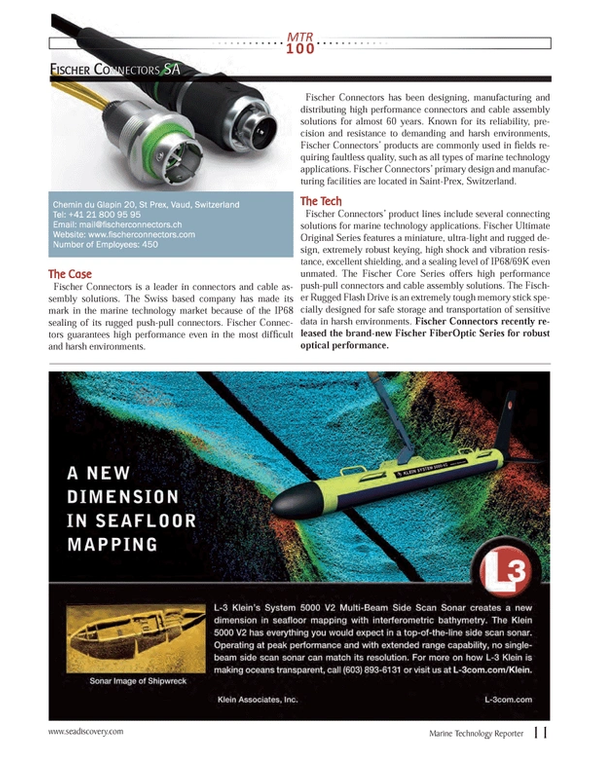 Fischer Connectors’ product lines include several connecting solutions for marine technology applications. Fischer Ultimate Original Series features a miniature, ultra-light and rugged design, extremely robust keying, high shock and vibration resistance, excellent shielding, and a sealing level of IP68/69K even unmated. The Fischer Core Series offers high performance push-pull connectors and cable assembly solutions. The Fischer Rugged Flash Drive is an extremely tough memory stick specially designed for safe storage and transportation of sensitive data in harsh environments. Fischer Connectors recently released the brand-new Fischer FiberOptic Series for robust optical performance.